In 1997, 22 year-old Robert Buhagiar graduated with first class honours in Electrical Engineering from the University of Malta. However his deep love for the pipe-organ led him to Italy, at Mascioni Organi Srl, where he worked hard to learn, acquire and practice the skills of the organbuilding trade. His good engineering background certainly helped a lot. Robert focused most of his training on the restoration of historic Italian organs but he also assisted the voicing (both in the shop and on site) of new organs to gain a wider exposure of different voicing styles. He acquired knowledge of correct restoration principles, ethics and procedures as well as a substantial cultural knowledge of the Italian organ patrimony. 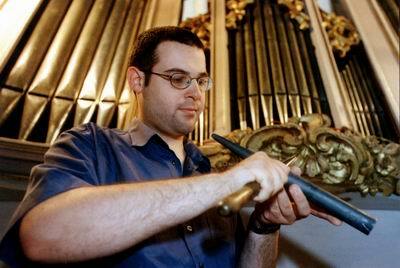 In 1999 he set up a pipe-organ restoration workshop in his home town Zabbar (Malta). He set off with the restoration of the 1922 pneumatic organ at Siggiewi Parish Church which was a big success recognized by local and foreign organists. This set a good reputation for quality which was confirmed and strengthened after each subsequent restoration work. Robert keeps constantly in touch with foreign organbuilders and musicologists for advice and sharing of knowledge. In 2003 he became the first, and only, Maltese member of the International Society of Organbuilders (ISO). His belief that life is a never ending learning process motivates him to continually seek improvement of the quality of his services.